NIR Roof Care, Inc.® > NIR Blog > How Do I Select The Right Roof Coating for My Flat Roof? Without a functioning roof, a business has no defense against the elements. And without the right materials, your commercial roof can’t do its job the way it’s supposed to. That’s why it’s important for you, the consumer, to be well-informed about your options and choose the right flat roof coating to meet your building’s specific needs. To better understand your roof coating options, you first need to understand what surfaces and roof system your building has in place. Each surface requires a different treatment, and not all surfaces are good candidates for roof coating. A gravel surface is extremely difficult to coat, but it has been done before. However, coating a gravel surface has limited success. Gravel is a poor candidate for coating as the surface is rough and inconsistent, and the material moves around too much to ensure even application of coating. Ethylene propylene diene monomer (EPDM) roofing can be coated, but product choices are limited. Workers can apply acrylic polymers and urethanes, and some manufacturers will extend their present warranties if this work is done. Check with the manufacturer of existing EPDM roofing for compatible coating products. Polyvinyl chloride (PVC) and other types of single-ply roofing are unlikely to benefit from coating applications. This is because most single-ply roofs have integrated solar protection and reflectivity that may be affected detrimentally once coatings are applied. Steep roofing tiles and sheet metal roofing can be coated, and newer engineered pigments for polymeric products offer a range of colors for coating application. As manufacturers originally developed roof coatings for application over bituminous roofing products, these are excellent candidates for coating. Provided the surface is smooth and accessible, both traditional built-up roofing and modified bitumen roofing can be coated with satisfactory results. Concrete roof decks are also excellent candidates for roof coatings. As concrete decks are typically adapted for heavy traffic, the surface lends itself to easy coating. 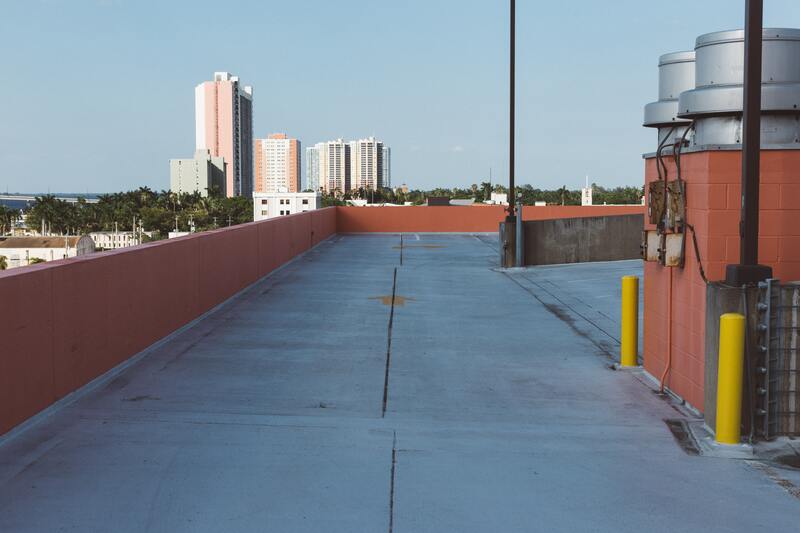 Parking decks usually feature waterproof coatings designed to withstand pedestrian and vehicular traffic, road salt, and oil. A number of polymers and epoxy products are available for concrete decks, but urethane coatings are the most cost-effective method for waterproofing traffic areas. What Coatings Do I Have to Choose From? Once the type of roof surface is established, managers have a number of different coating types to choose from based on what the roof needs. Asphalt cutbacks are bituminous products thinned with a solvent to aid application. Manufacturers add aluminum pigments to the topcoats for reflectivity, while other modifiers enhance strength, longevity, and thickness. Fiberglass strands provide additional reinforcement. Asphalt emulsions are similar to cutbacks but use water as a carrier instead of solvents. Some emulsions comply with minimum standards for volatile organic compounds (VOC), and emulsions have many of the same modifiers and additives as asphalt cutbacks. Aluminum pigments added to asphalt cutbacks and emulsions add to coatings’ solar reflectance index (SRI) values to control the reflection of solar radiation and emit stored radiation from the surface. These new-generation coatings have a highly reflective surface, often exceeding the SRI scale. Most highly reflective acrylic elastomers are white, and workers install them over existing bituminous or non-bituminous roofing. They are typically specified at 12 mils thick for five-year warranties and 20 mils for ten-year warranties. These polymer-modified products are relatively new to the market. Some are specified at similar application rates to acrylic elastomers, and some are specified at much thicker dry thicknesses of up to 60 mils, which is similar to urethane coatings. Polymer-modified products and silicone coatings not already mentioned are less common, but manufacturers are always modifying formulas and new products regularly enter the market. Another polymer-modified product, urethanes are usually installed on concrete substrates, such as parking decks or on wood substrates. Urethanes are one- or two-component formulations, and typically are not applied over other roofing products. This is a spray-applied foam that is actually an insulating system, not a coating, but is worth mentioning. SPF roofing forms to any roof curb or penetration and provides insulating value. The surface of SPF insulation is coated with a urethane for protection and waterproofing. What are the Most Common Coating Issues? Even with the right choice in coating material, issues can arise that compromise the functionality of the coating. It is vital to know how your coating material is affected and what problems it could have. Poor product choice – It’s possible that the wrong choice in coating material was made. Sometimes even the manufacturers are low quality. Cheap, poorly-made products or incorrect products do not perform the right functions for the roof surface. This does more harm than good. Expectation of leak repair – Many coatings provide solar protection but not monolithic waterproofing. Some coatings are not even designed to seal leaks, and others only offer limited abilities to bridge cracks and voids in an existing membrane. Repair leaks and irregularities before applying a coating. Blisters and Delamination – The presence of moisture or contaminants under the coating causes blistering and delamination. A long history of leaks in a roof will trap moisture between its plies and make the insulation wet and rigid. Failure to apply a primer disallows the coating to seal correctly. Remove all moisture, scrape loose material from existing coatings, and ensure a dry surface so coating is applied well. Inconsistent application – A complete, monolithic, and continuous surface with consistent thickness ensures proper coating performance, and prevents pinholes, skips, and holidays that keep the coating from sealing adequately. Extreme temperatures – Applying a coating during the hottest day of summer or the coldest day of winter is ill-advised. Problems with cure times and product quality will arise. Do not install below 50 degrees or above 90 degrees Fahrenheit. Heed minimum and maximum ambient temperatures established by the coating manufacturer. Coating pot life – Mixed on site, two-component coating systems have a pot life, and begin to cure once they are mixed. Mixed or applied improperly, these systems can cure too quickly or not at all, creating a dysfunctional coating either way. Inadequate surface cleaning – To provide a reflective surface that will save energy after a coating application, workers must keep it clean. Soiled surfaces negate any energy savings a reflective coating can provide. Infrequent reapplication – Many coatings have recommended service lives of only five years and must be reapplied to perform properly. Disregarding manufacturing recommendations – Sometimes the issue is moisture, leak repairs, primers, surface preparation, application temperatures, mixing, cleaning, or service lives. Coating application requirements vary by manufacturer. It’s important to consider all options when deciding what to do for your commercial roof needs. There are a variety of different products for different flat roof surfaces. The right choice in coating can extend the life of your roof and prevent leaks that damage your building. When choosing a coating, consult with a technical representative. Read manufacturer recommendations, and ensure the contractor follow recommended practices for all coating applications. The Certified Roof Care Specialist®s at NIR Roof Care® are experts at all of the above. Additionally, opting for one of our many Roof Care Plan®s will ensure your roof’s coating is maintained and kept in the best condition to extend the life of your commercial roof. For almost 40 years, NIR has helped companies make the right choices for their roof’s care and save money in the process. Get in touch with a representative today to cover all of your roofing needs. At NIR, Your Roof’s Care Is Our Concern®! Thanks for explaining how to pick a good roof coating. I actually didn’t know that acrylic elastomers could be installed over existing bituminous or non-bituminous roofing. I’m interested to learn if this could mean elastomers could be easier to install if they can go over existing roofing materials.